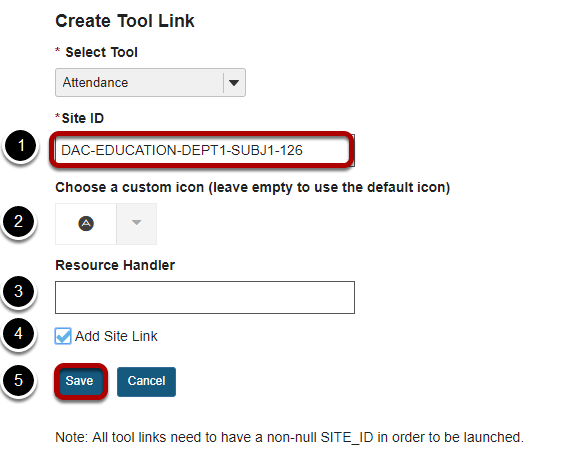 Sakai Community DocumentationSakai 12 Administrator Guide (English) External ToolsHow do I add an LTI tool to a site as an admin? 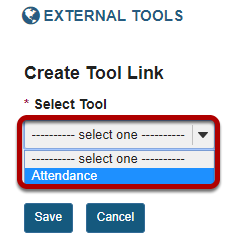 Select the External Tools link from the Tool Menu in the Administration Workspace. Click the Create Tool Link. Select a tool from the drop-down list. Note: Only previously installed tools will appear in this list. If the LTI tool you would like to add does not show up in the list, you need to install the LTI 1.1 or LTI 2.x tool first. The Site ID is required. (Optional) Select a Custom Icon for the tool. (Optional) Specify a Resource Handler for the tool. (Optional) Check the box to Add Site Link. This will place a link to the tool in the destination site's Tool Menu. View tool links to sites. Zoom: View tool links to sites. Once you have added the tool link, you will see it in the list of tool links to sites in the system. One tool may have many links if it has been added to several sites. Prev: How do I view currently installed LTI 1.1 tools in the system? Next: What is the Job Scheduler?